We first took a look at what 704Games was up to with the launch of NASCAR Heat Champions: Road to Miami. We later decided to sit down with the team and talk about what made them look to esports and why NASCAR can work with the success of Sim Racing. We spoke to Sean Wilson, Executive Producer of NASCAR Heat 3. With 22 years in the gaming industry behind him, 8 years of NASCAR game development and a studio that has been focused on esports initiative for the past 2 years, Wilson is well placed to discuss the studio’s ventures. We spoke to Wilson to find out exactly what’s next for NASCAR esports. Esports Insider: What made the studio decide to pursue esports in this latest title? Sean Wilson: Racing is such a great genre for esports. We’ve had online functionality for a full NASCAR field – 40 players – for a few years now, and the racing has always been really fun. We began to see players and even some of the actual NASCAR teams getting involved in our game and also esports so it seemed like a natural extension. 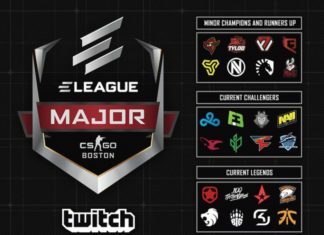 With the interest in esports growing, it seemed like everything lined up. We’re excited about our first season event, which culminated last weekend alongside the NASCAR Championship in Miami.NASCAR is a competitive sport with a ton of great personalities including the fans. ESI: Sim Racing has had a strong year as an esports. What has the reception been like from teams in NASCAR about esports? Sean: We’re lucky in that we’ve been working closely with many of the teams and drivers over the years to make sure we are representing the sports authenticity in the NASCAR Heat series of games. They have always been willing to give us feedback as we develop the games and its invaluable. When it comes to the esports side of things with teams I am, unfortunately, not able to share too many details at the moment, but we have ongoing talks with those in the industry and hope to have some exciting updates in the future. ESI: Esports is a global sport, NASCAR has traditionally been in the South and Midwest of the USA. Does that present any challenges? Sean: Not really. One of the unique qualities of esports is attracting new fans. The buzz that esports generates is enough for us to break down barriers to grab the attention of gamers, especially racing gamers. We’ve seen fans of the genre start playing NASCAR and their skills are able to translate over pretty well. At the end of the day, good racing is really exciting to watch. ESI: Based on that, how do you look to appeal to the growing Sim Racing esports scene in Europe and beyond? Sean: At this time, we’re not focused on the sim racing experience. NASCAR Heat 3 is designed to be accessible to everyone so that anyone can quickly pick up and play. We see NASCAR Heat 3 as the gateway to more serious racing simulation experiences. For now, we’re focused on casual racing fans or sim racing fans that just want to have a bit of fun with something a little different. With our recent investment from Motorsport.com, we’re excited to have a bigger presence in Europe and the opportunity to reach new racing fans with our games. ESI: From the studios point-of-view, what do you hope to achieve from esports this year and moving forward? Sean: We hope to bring fans closer to the action than ever before with our at-track promotions while increasing fan interest in general, not only in our games but in the sport of NASCAR. Esports is a key way to bring youth into the sport, and that’s important to us, NASCAR, and the race teams. We intend to harness the enthusiasm and resources of all these entities to become the premier destination for racing esports competitions. We have big plans, and we’re only at the beginning. ESI: How can people find out more and take part in the upcoming NASCAR Heat 3 events? Sean: You can find out more info about NASCAR Heat Champions by visiting nascarheat.com, or following us on our social channels, including Twitter at “@704NASCARHeat.” Thanks very much!